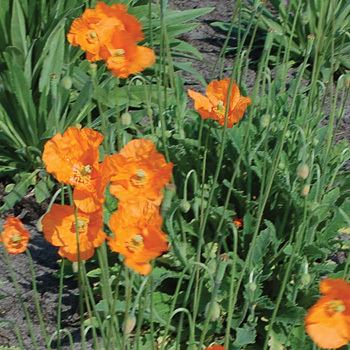 This rare hardy poppy with single crinkled blooms was extolled by garden writer Louise Beebe Wilder in the 1920s as "sending up a veritable fountain of bloom on stems of a seemly length." It self sows freely and is great for covering difficult dry banks with flowers, the apricot blooms combining beautifully with blue German catchfly. It does well in poor to well-drained soils. Depth: Surface sow; press in. These seeds require light to germinate. Starting Outdoors: Direct sow in mid-spring to early summer for flowers the next year. Poppies are a must in the cottage garden. They are great for back borders or along a fence, but these orange beauties will be just lovely almost anywhere with full sun and regular, very well-drained soil, and will attract bees as well as other beneficial insects. Plant: Silvery-green foliage is somewhat lance-shaped and toothed with protruding thick flower stems.